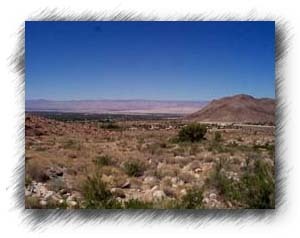 I drove to Palm Desert, CA from Laguna Hills, CA on Hwy 73 over Ortega Hwy through Elsinore. 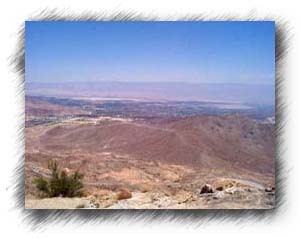 This is the view when I came over the mountain and saw the desert. The air felt like a blast furnace. 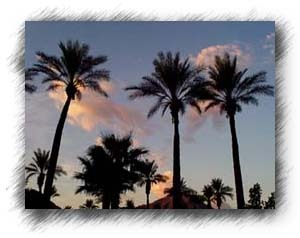 It was about noon and the temperature was about 103 F in Palm Desert. 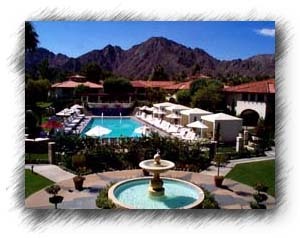 This is the MiraMonte Resort on Hwy 111 in Indian Wells where I stayed. The hotel and the grounds are very nice. The resort is located next to a giant palm grove. This is the evening sky outside my hotel room. An evening sunset from hotel. The week that I as there, there were many clouds and it was more humid than usual. 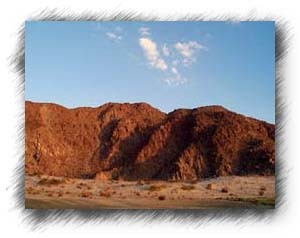 This was the hills just before you get to the La Quinta Resort and Spa, in La Quinta, CA. 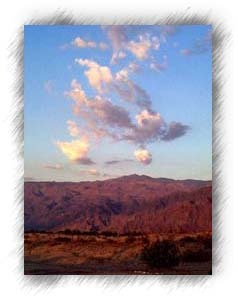 Another image of the hills by the La Quinta Resort and Spa. 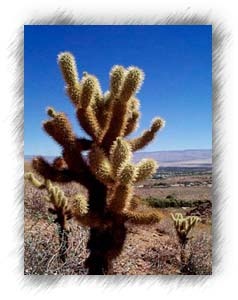 At the end of my week of work there, I decided to take a day to play and discover a little about the desert. I like to hike, so the concierge at the MiraMonte suggested a few places. 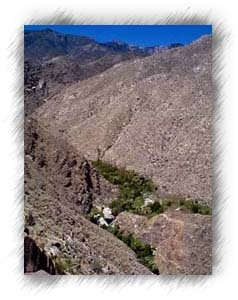 The one that I chose was an area called Indian Canyons. 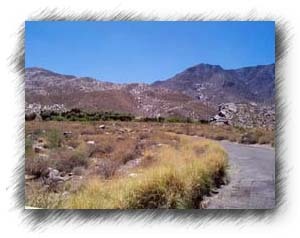 It is located just south of Palm Springs off of Hwy 111 at the end of South Palm Canyon Drive. Any one can point you in the right directions. I got there just before 8:00 am when the park opens and waited about 15 minutes only to find that I had to have cash to get in. I turned around and went back to town to a cash machine. 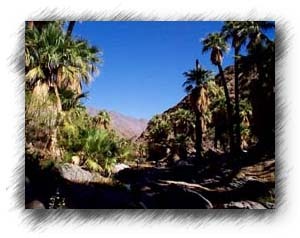 When I returned, I went to Palm Canyon first since from the brochure, it looked like the nicest. "The canyon is 15 miles long and one of the great beauty spots in Western North America", according to the brochure.This is a photo of me standing in the road that you had to pass through to get to Palm Canyon. It is a very narrow passage, although a medium size motor home did make it passed, inspite of a sign advising to the contrary. This is looking into the first palm area. 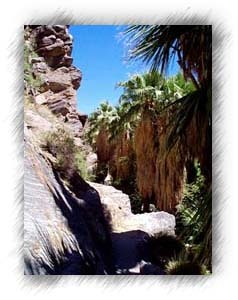 You will notice that the palms in these canyons grow due to year round water. Like an oasis. Underground springs feed these streams. In a small canyon looking up at the cliffs. 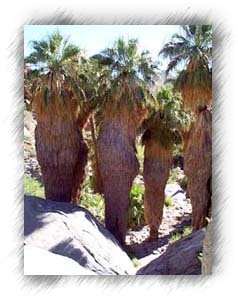 In these canyons, one one trims the dead frons from the palms so they look like they have figures and sometimes like skirts. There was no real water in this part of the canyon. It was a little damp, but no running water. This is looking back further into the canyon. Just to the right of where this picture is taken there is a gift and Indian craft shop. Here in the other part of this same canyon, there was a little water running in the stream that looked like it may be a stream of 5-7 feet wide in the winter months. 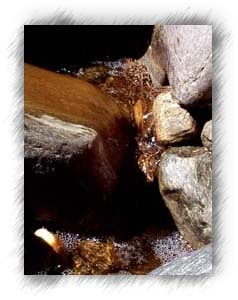 Because there is very little activity or visitors this time of the year, it is wonderful to hear the sound of the water in the stream. It is cool in the shade of the palms. 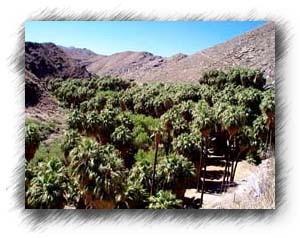 There were thousands of palms and other vegetation in these oasis canyons. 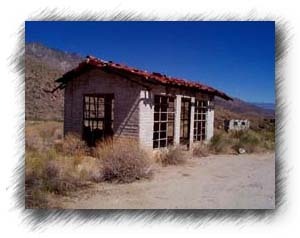 On my way to Andreas Canyon, I stopped at what appeared to be a gas station at one time (above). In the background you can see what must have been the restrooms, they were plumbed as such. 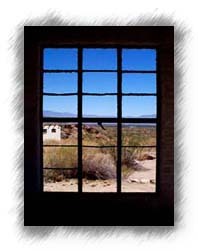 An interesting view out the window toward Palm Springs (left). 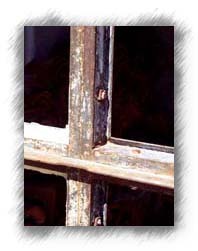 A detail of the window frame that has not seen glass in a long time (right). 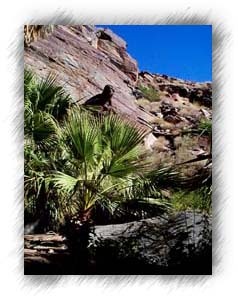 As I approached Andreas Canyon, I could really see the contrast of the palms against what appeared to be a completely dry and lifeless hillside covered with nothing but rocks. As you will see this is not the case at all. 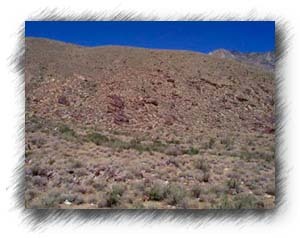 When I got to the parking lot of Andreas Canyon, I was able to find a place in the shade, mostly due to there was only about 5 other cars there. 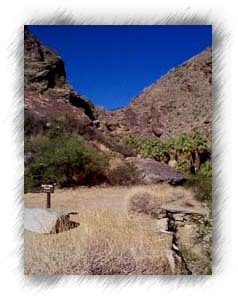 I was going to go into Murray Canyon, which was mentioned in the brochure as the least traveled of the canyons, when I saw a sign for a trail to an abandon mine. I was intrigued and decided to go there instead. I made sure that I had plenty of water, since the sign said the trail was about 3.8 miles and it had an elevation climb of about 2000 ft..
As I walked along the trail I discovered lots of small and large plants growing in among the rocks. I guess the moisture that gets trapped in around the rocks was enough for some of the plants. Here is a sampling or what I saw. 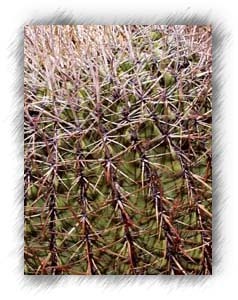 Detail of the cactus on the left (right). 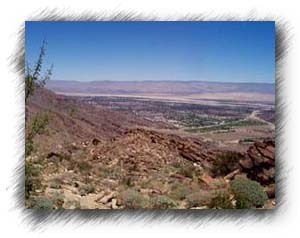 From my hike I could look back and see the oasis of Andreas Canyon and Palm Springs in the background. 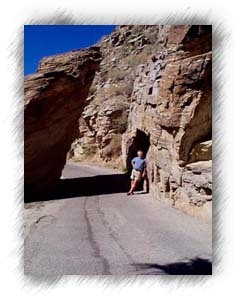 The photos below are Andreas Canyon beyond what visitors can see by going into the canyon. 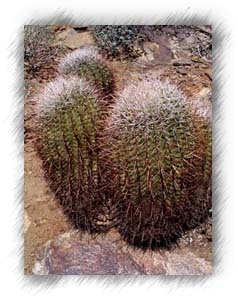 These were taken from on the trail about 500-800 ft. about the canyon. The right photo is a closer shot of the left. If you look closely at the right photo, you can see a water falls to the right of the two lightest rocks about 2/3rds down the photo. The falls looked like it dropped about 30-50 ft. and had a lot of water in it. As I climbed to the top, there were no markers on the trail to let me know how far I had come or how far it was to the mine. It was getting very hot and my water supply was running low. I had to find shelter from the sun at rock outcroppings. Finding shade was not easy and once I had lay under a rock not much larger than me that gave me only about 3 inches of clearance for my body to fit under it. I had to lay flat on my back. I never did make it all the way to the mine. I figured that I was somewhere around 3/4 to 4/5 there when I decided to return to the canyon. When I reached my car I was out of water and exhausted. I did not realize how much so until I sat in my car and drank another 3/4 bottle of water and than immediately fell asleep for about 45 minutes. 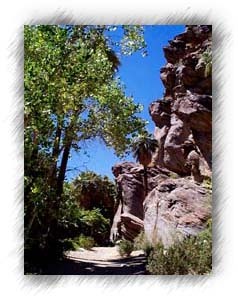 When I woke, I decided to take a walk there in Andreas Canyon along the stream, which I did not know existed till I walked a little way into the canyon. Along the stream there are a number of places to get wet. At the end of the canyon there is a little falls (18-24") and a small pool between two large boulders and I took off my clothes and sat in the water. It was very refreshing. 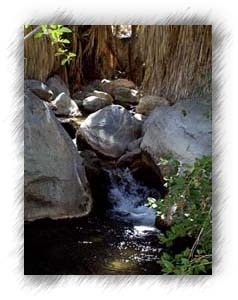 This is an example of what the stream looks like along the way up the canyon to the end. 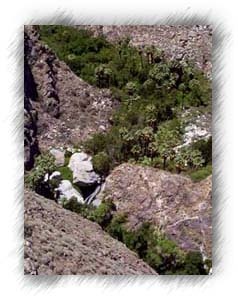 The pictures you saw earlier of the back end of the canyon are not accessible by walking back the canyon. It is private property and there is a fence and signs posted "No Trespassing." 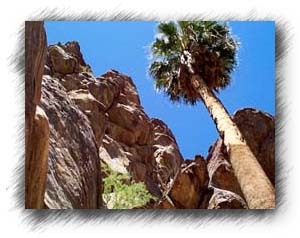 More of an idea of what the canyon walls and the palms look like. The air is very cool and fresh smelling all along the stream. 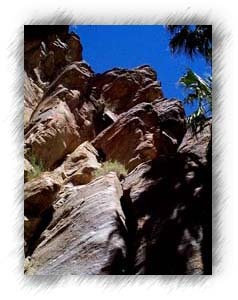 The formations of the rocks vary with every step you take. Looking back into the canyon from the parking lot. 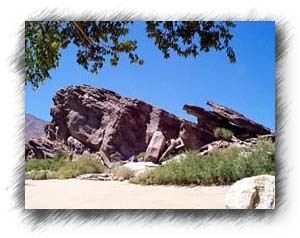 Some of the rock outcroppings, like this one, are spectacular! There is evidence of earthquake action all over these hills. Looking from the parking lot back toward Palm Springs. 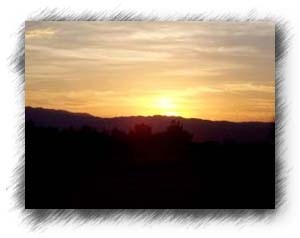 When I left the canyons, it was about 108 F and I headed back across the hills to Laguna Hills, CA. about 3:30 p.m. I had a wonderful time. 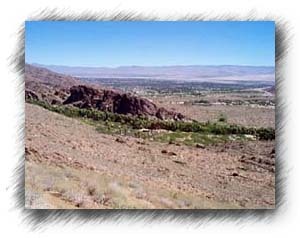 I have no idea of what the desert is like in the winter, I just know that whenever you get to the Palm Springs area, you must venture to the Desert Canyons for a visit. Oh yea, take plenty of water. attractions,Golf Courses,Real estate,Homes for rent and more. Text and Photography by Gar Benedick. Copyright ® 1999 Gar Benedick.